When there’s something quite bizarre in the locality, who are the individuals that one should send a telegram to? Why, it’s Ignatius Blackward and Nadia Franciscus of course. These two swashbuckling heroes will use their wits and weapons to bring an end to the horror unleashed on old London town by the nefarious alchemist Adam Crowley. Nightmare Creatures should install without any issues on a modern PC. Simply insert the CD-ROM into your computers optical drive and follow the on-screen prompts. If the installation process doesn’t start automatically, browse to the CD-ROM in Computer/This PC and run the Autoexec.exe file manually. During the installation process you will be asked what type of installation you want to do, we recommend “Max” installation for best performance. When installation is complete, choose “3D Settings” before you attempt to start the game and then proceed to the next section. Nightmare Creatures actually runs surprisingly well on modern PCs, though there are a few things you need to do before you can play. First of all, when installation is finished, choose “3D Settings”. The window shown below will then appear. Make sure that “Enable 3D Hardware acceleration” is selected. Under “3D Hardware acceleration preferences” ensure that “Custom” is selected. 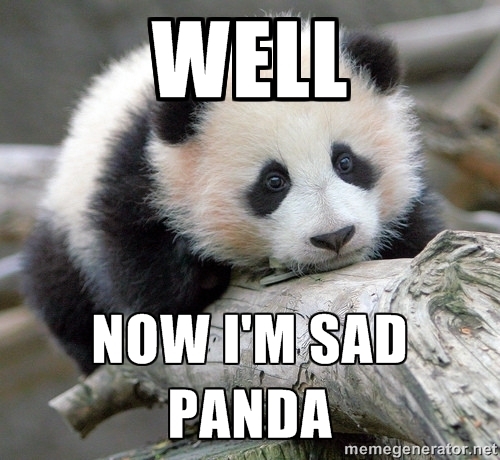 Now, make sure “Zbuffer” and “Animations” are selected, then click on “OK”. After setting these options, you will be prompted to reboot before playing, so do so now. Unfortunately these are pretty much the only visual tweaks you can do to the game. When playing, the game seems to be fixed at a 640×480 screen resolution, with the option to change screen resolution in game simply glitched out. Before getting into the game it’s a good idea to install the 1.2 patch. This patch improves compatibility with some video cards. You can download the patch here. 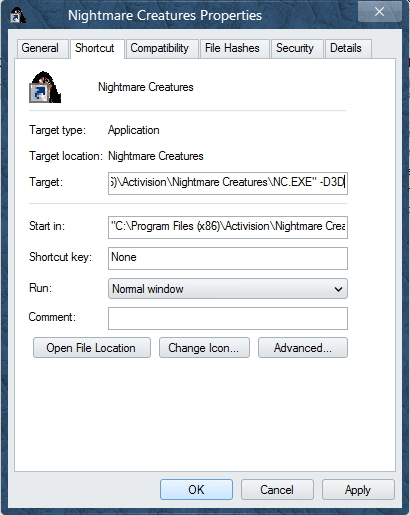 Once the patch has downloaded, install it by opening the zip folder and copying the “NC_V12.exe” file to your Nightmare Creatures game directory (C:\Program Files (x86)\Activision\Nightmare Creatures by default). To make sure that the correct, updated version of the game gets launched, you should rename the existing “NC.EXE” file to “NC-OLD.exe” (or anything similar). Now, rename “NC_V12.EXE” to “NC.EXE” and you’re all set. Before you can start the game, you will need to force it to run in Direct 3D mode. To do this, first find the games shortcut. If you’re running Windows 7 or Windows 8 with a Start menu replacement, simply search for “Nightmare Creatures” on your Start menu, then right click on the shortcut icon that appears and choose “Properties”. If you’re running a stock Windows 8 machine, search for “Nightmare Creatures” on your Start screen and then right click on the icon and choose “Open file location”. This should send you back to the desktop with an Explorer window open. In this window you should see a “nightmare Creatures” icon. Right click on that and choose “Properties”. At this point the Properties window for the games shortcut should appear. The first thing we’re going to do is check that the shortcut is valid. The games installer does not always create the shortcut properly, so we’ll need to do a little editing. On the properties Window, click on “OK”. If the window closes without any problems, skip ahead to “Forcing Direct 3D mode”. On the other hand you might see a window appear like the one show below. If this happens, we need to manually fix the shortcut. Doing so is easy. Simply open the Properties window again (if it isn’t already open). Now, find the “Target:” box and place your cursor at the very beginning. Insert a quotation mark (“) at the start of the box. Now, press the “End” key on your keyboard to go to the very end of the text in this box, and insert another quotation mark here too. Repeat this process with the “Start in:” box too, if there are no quotation marks in there already. Click on “OK” when you are done. If you followed the steps correctly, the window should close without generating any error messages. We need to make sure that Nightmare Creatures runs in Direct3D mode whenever it starts up. To do this, open the shortcut properties window as described above. Now, place your cursor into the “Target:” box and press the “End” key on your keyboard to move to the very end of the line. Now, leave a space and enter the characters “-D3D” (do not enter the quotation marks). The picture below shows how things should look (click on the image to enlarge it). Click on “OK” and the window should close. 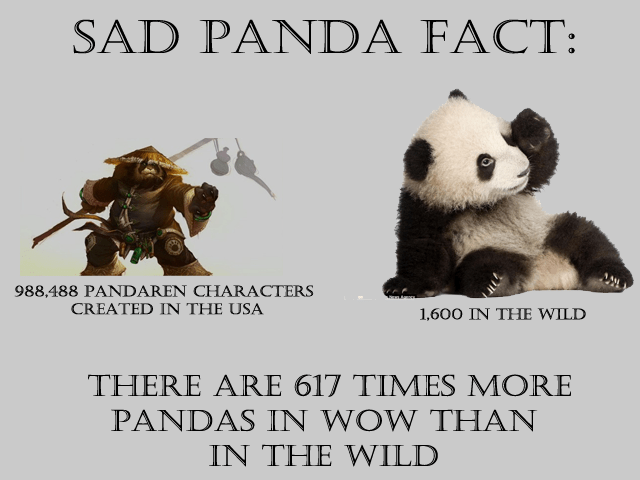 You can now go ahead and start the game. After watching or skipping the games intro, the first thing you’re going to want to do is setup the games controls. You can do that from the games main menu by choosing “Options” and then “Setup Controls”. 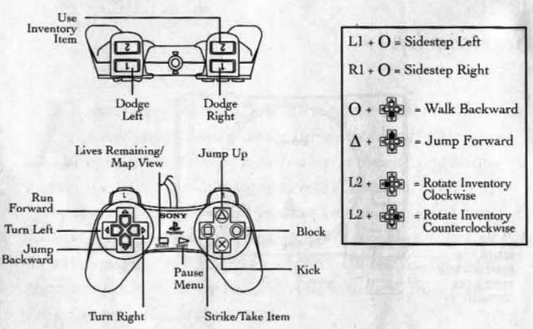 For reference, the original PS1 controls are shown below. The game pre-dates the introduction of analogue controllers so is designed entirely around digital only gamepads. Despite this, the game actually recognises most inputs on modern gamepads, even analogue inputs are supported. 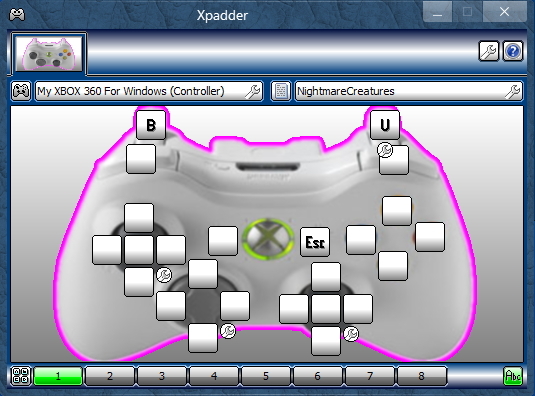 For the Xbox 360 pad, there are still a few controls that really need to be configured using Xpadder. Our Xpadder profile for the game is shown below. The game will recognise both of the Xbox 360 controllers analogue triggers as being the same input. This means there are not enough inputs to allow you to select an item from your inventory (the d-pad cannot be configured either). To get around this, we’ve assigned a couple of keyboard commands there instead. Make sure when setting up controls in game that you assign “Browse Item” to keyboard input “B” and “Use Item” to keyboard input “U”. Escape is mapped to start simply to allow the game to be paused. Everything is now set for you to take on Adam Crowley and his cronies, good luck and Godspeed! Problems saving games and configurations – Like many old titles, Nightmare Creatures saves its game data and settings into the same folder as the game itself. In some instances on more modern versions of Windows, this will mean that save games and configuration files cannot be written. To solve this problem you can either run the game as administrator (right click on the games icon and choose “Run as administrator”) or, better still, set the permissions on your game folder so that your user account has full control/read write permissions. You can find a tutorial on how to configure folder permissions here. The games default installation directory is “C:\Program Files (x86)\Activision\Nightmare Creatures”. PowerVR 3D Card Error – If you see an error window relating to a PowerVR card, then you forgot to add the “-D3D” option to the games shortcut. Follow the steps under “Starting the game” carefully and try again. Nightmare Creatures was a commercially successful game when it was released in 1997. Playing the game today it’s remarkable just how far 3D combat games have come along. Compared to genre benchmarks like Bayonetta 2 or DmC – Devil May Cry, the game not only looks primitive but plays primitively too (no, the game isn’t glitching, that’s really how your character moves). In short, the game is probably just too dated to win over any new fans, but those of you who remember it from back when it was new might have fun revisiting it again. The game runs too fast on my machine (Windows 7, i7-4790k, GTX 970, 16GB RAM). What can I do to make it run properly? try to turn off some of your computer cores or try to use compatibility mode.